How to revert to an earlier version of a Klip – How can we help you today? Klipfolio includes a revision history list that allows you to view and revert back to an earlier version of a Klip. The list of revisions includes auto-saved Klips and the last five times you saved a Klip. Restoring your Klip to a previous version does not eliminate any Klip versions. Rather, the restored version moves to the top of the revision history list. 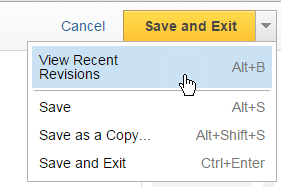 In the Klip Editor, select the Save and Exit arrow to see more options. Select View Recent Revisions to access a list of recent revisions (or use the keyboard shortcut of Alt+B). Click a revision date to view the previous version of a Klip. Verify that the Klip version is the version you want restored. Select the Save and Exit arrow. Select Save (or use the keyboard shortcut Alt+S). Important: You must save a Klip before a revision replaces the current Klip.